Is this a rare Canadian M2? 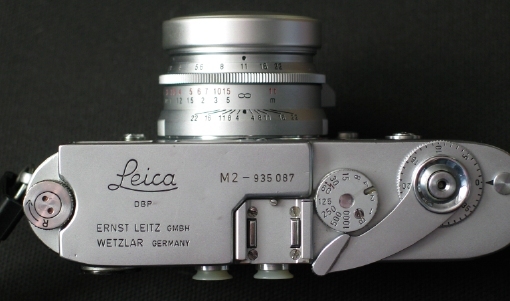 Discussion in 'Leica and Rangefinders' started by philippe_vandenbroeck, Aug 20, 2004.
reply. Maybe there is someone on this forum who can help me out with this. Every Canadian M has a larger engraving for the camera identification than the serial number. In other words, the engraving on your camera reads like this: M2 1017511. The "M2" engraving on Canadian M cameras is about 20% larger than the serial number (as if the engravings were done at two different locations at two different times). unfortunately it looks like your camera is not in these ranges. Tommy: Philippe is referring to the 200 Canadian models produced in the sr. number range 1017501-1022000 (not included in your list). His camera falls in this range. Ghester Sartorius, "Identifying Leica Cameras"
alternatively if someone has Lager's books to cross verify.. This is a bit academic. To a collector, a Canadian production M2 is not worth any more than a German M2 unless it is engraved "Midland Canada" on the top plate. A very small number were so engraved, far fewer than the 1500 or so Canadian M2s. Dealers or sellers will try to make a big deal out of the fact that it is listed as being produced in Canada, but people are just not willing to pay any premium. The same goes for M3s, some of which are listed as having been produced in Canada. Sorry. input, especially from Mr. Blackwell! "The "M2" engraving on Canadian M cameras is about 20% larger than the serial number (as if the engravings were done at two different locations at two different times)." Sorry to say, but larger "M2" engraving does not make it a Canadian version. Every M2 and M3 that I have seen is like that, and they were not Canadian versions. I hate it when I have to contradict myself, but Nick is right. In fact, your camera looks like a standard German made M2 to me. What I said about the M identification engraving was basically flawed; the Canadian style of the M identification engraving is a bit different (and a bit larger by about 20%) than the German version. The Canadian "M2" would almost look stamped on (as opposed to being engraved). These things are often difficult to explain, and I was relying on my memory as to the Canadian M identification. Please accept my humble apologies for the contradiction. The "M2" on mine is taller than the serial number, as well. Mine's not on the list, either. FWIW: Your serial number is number 10 out of a block of 400 assigned to M2s in 1961 (1017501-1017900). According to a list in Dennis Laney's collectors guide, these numbers were not tagged as Canadian-made ("ELC"). Three 1961 serial number blocks were assigned as M2-ELC: 1017901-1018000, 1020101-1020200, 1036001-1036050. Total 250 Canadian M2s in 1961, vs. 9300 Wetzlar M2s (200 black). If your camera isn't marked "ELC" or "Canada" somewhere, I don't see any evidence that it's anything other than regular Wetzlar production. If you type Philippe's SN:1017511 you get "Leica M2" in response. 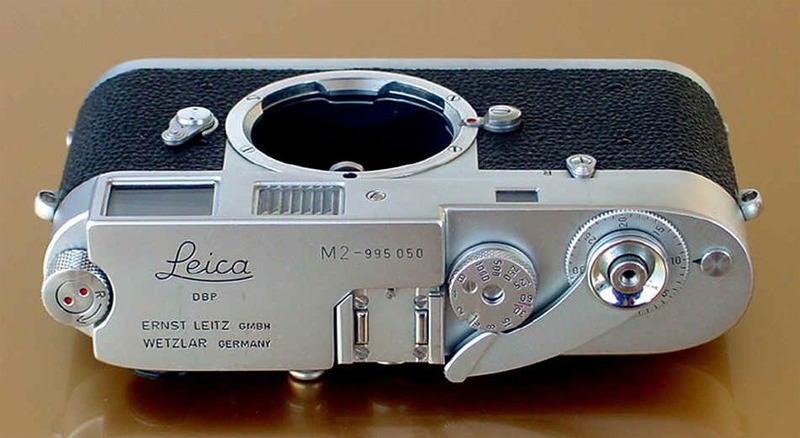 If you type Bill's SN: 995050 you get "Leica M2 ELC". From that I would conclude that Philippe's M2 is not made in Canada. Interesting, Niels, thanks. If you type in 935500 the result is Leica MP2. What's an MP2? confirms that I have two German M2s. Which is fine with me! Again, many thanks for your contributions. It's very much appreciated. approximately 15 cameras and as such are extremely rare"
Rarity rating is between R9 and R10 (with motor) so its Extremely rare. Whoops! Thanks Tommy, I'm rich! I guess I have an MP2... According to the Leica Model Inquiry page, there's a block of 512 serial numbers set aside for the MP2 model, from 935001 - 935512. 935000 is a IIIg, and 935513 is an M2. My button-rewind M2, whose top markings (exc ser# 935087) are identical to Philippe's, would seem to be the 87th body in the MP2 block. I bought it used in 1967 for $150; have I hit the collector jackpot or is there an error somewhere? No Doug, you have a plain old M2. Although 500 serial numbers were set aside for the MP2, they only produced about 12 or so, and the additional serial numbers were probably just used for regular M2s. BTW, I saw an MP2 with the motor and battery and cable connections complete offered for $ 80,000 by a dealer in Britain a few years ago. I don't know what happened to it though. Unfortunately it isn't and Eliot is correct. engraved with "MP2" preceding the serial number on the top-plate. for setting up the motor drive for continuous shooting. Oh, well! Not surprised... But good to have a little digging through the resources. Thanks! 13843XX Product	? Leica M4 Schwz". Any idea what "Schwz" means? "Schwz" means black (in this case black chrome). "Lack" or "Schwz lack" means black paint. The earlier M4s were offered in chrome or BP. The later ones were offered only in black chrome. Thank you Eliot. Much appreciated!! My M2 has a 20% larger marking of "M2", and the serial # is 11327xx. Is this one of the Canadian M2s? I found this page by searching "leica m2 canada" since I found the serial no. is for ELC!